The SEO environment is a whole jungle of different techniques that can be used to improve a site’s visibility in the search engines. Yet, there are plenty of monster mistakes in that jungle that can jeopardise a campaign’s success, especially when it comes to keywords. Journeying to a destination without directions is sure to get you nowhere fast and the same goes for an SEO campaign without keyword research. Keyword research is the core to your apple; the seed to your plant; the basis of your keyword optimisation. Before you begin with SEO, you need to search and discover how your customers are finding you. Sure thing, if you’re an ice cream shop you can focus on the keyword ‘ice cream’ and probably enjoy a lot of traffic to your site but what are these visitors looking for and are they going to convert? Traffic is low-quality unless it has found you for the right reasons – for example, changing your keyword to ‘buy homemade ice cream’ could attract more relevant visitors and make all the difference. And remember, Google’s latest Hummingbird update places more of a focus on long-tail, descriptive keywords. Think about how your target audience would communicate with a search engine to find what you offer, and cater for their needs with your keywords. Ok, so you’ve found your best keywords. What you don’t do next is use them to litter your site copy. How would you like to read a page that mentions the phrase, ‘buy homemade ice cream’ every other sentence? Well, you’d probably turn your nose up and so would the search engines. If you use keywords too many times in your copy, you will not only damage the quality of your content but you will get picked up by the search engines for ‘keyword stuffing’ which will harm your rankings. First and foremost, remember that you’re writing to a human audience, not a robot. Create quality content and then fit in your keywords where they appear most natural and you’ll be rewarded by better rankings and more satisfied, converting visitors. 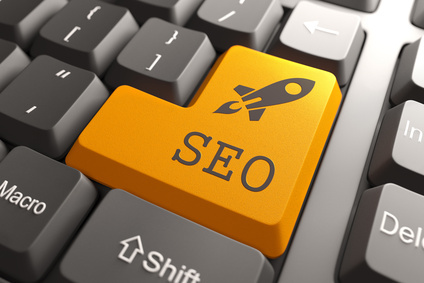 Keyword optimisation goes further than your copy – it goes deep into the coding of your site. Ignore this area of on-site optimisation at your peril. A site without optimised title tags, image tags and Meta tags is a site of little value both to the search engines and your consumer. The first thing you need to do is to make sure that the main keyword of each page appears in both your title tag and its URL. This way, search engines can work out exactly what each page of your site is about and will know which terms to rank you for. Another mistake that you must avoid is leaving search engines to their own devices with your Meta descriptions. Your Meta Description is the short chunk of content that appears beneath your website link in search results and if you don’t choose what it will be, Google will randomly select it from your page. These descriptions no longer affect your search rankings, but forget the robots for a second – your site will be seen by your potential customers too! Attract customers with appealing copy that describes exactly what they will find on your website. And, include the keywords that feature in your page title so when these keywords are used in search, more of your listing will appear in bold and your site will stand out and appear more relevant to traffic. This entry was posted in SEO and tagged keyword research, keyword stuffing, keywords, SEO, SEO copy, SEO keyword mistakes on December 6, 2013 by Pinnacle.